Mt. Taishan is situated at the center of Shandong Province and dominates the horizon of Tai'an and Jinan cities. Covering an area of 250 square kilometers, it was known as Mt. 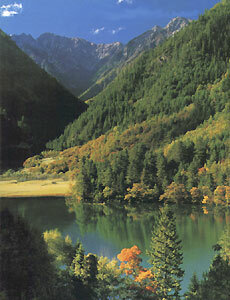 Daishan before the Spring and Autumn Period and is famous as the Eastern Peak of China's five sacred peaks. The majestic mountain has magnificent scenery and attracted leaders of several dynasties as a site of Buddhist pilgrimage. Among the emperors that have climbed the mountain were Qin Shihuang, Han Wudi, Tang Xuanzong and Qianlong, as well as 72 kings from a variety of small kingdoms throughout China's long history. Mt. Taishan has a rich natural heritage. The mountain sports 112 peaks, 98 cliffs, 18 caves, 58 rocks in fantastic shapes, 102 streams, 56 waterfalls and lakes, 64 springs, and 989 kinds of plants in 144 branches The vegetation coverage is as high as nearly 80 percent The mountain's historical and cultural heritage dates back several thousand years It boasts 22 ancient building groups, 97 historical ruins, 819 steles from various historical stages, and 1,800 carved sculptures. These are important reference materials for the study of Chinese history and calligraphy. The main attractions include Han kuang Hall, the South Gate to Heaven, Pixia Temple, Sunrise Viewing Peak, hngshi Valley and black Dragon Pool Nit Taishan is a sacred mountain famous for its aesthetic, scientifc, historical and cultural value.